Getting more from tags and using Apple’s Files app. I’m trying to show how Apple’s iPad Pro sets new boundaries for mobile computing and offers a real alternative to a laptop for many of us. Today we’re taking a look at the Files app and how to use it effectively with an iPad. 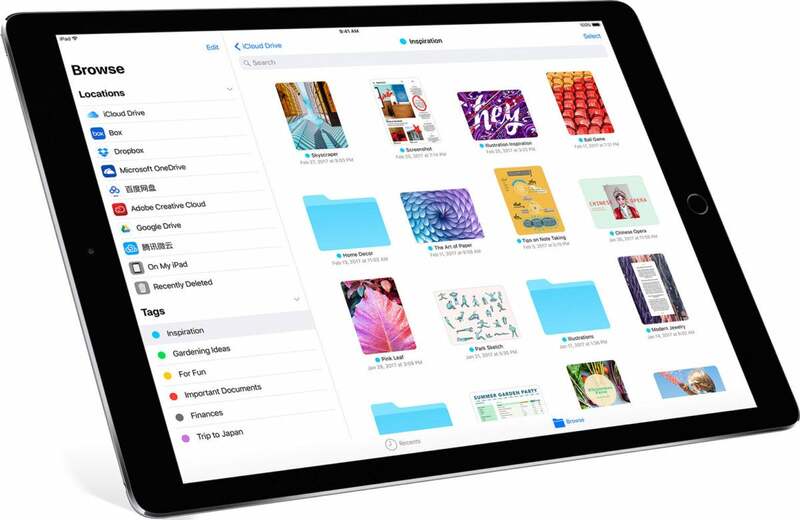 Files is a cloud-based data storage system that is compatible with Macs, iPhones, and iPads and works to make sure all your information is accessible to you when you are logged in with your Apple ID. The app provides a neat, unified way for you to manage everything you have stored in iCloud and popular third-party services, including Dropbox, Box, and OneDrive. Adobe Creative Cloud and Google Drive are also supported. The sidebar shows a list of sources split between Locations (On my iPad, iCloud, and other services such as Dropbox), Favorites, and Tags. You can open, edit, and delete all these items, move them around, open them in compatible apps and more. Tags sync across all the Apple devices you are using under your Apple ID, which means tagged items should be easy to find on Mac, iPad, and iPhone. Search is supported using the top Search bar. When you open a folder, you will find everything organized in icon and list views; the type of view is controlled at the bottom of the screen. Tap and pull the screen down slightly to discover new controls situated at the top of the Files window that let you create a new folder, organize folder contents by name, data, size or tags, and shift between icon and list views. What can you do with these files? To open a file, tap it. Tap and hold it to find additional options in a contextual menu. Some files can be looked at and worked on from inside Files, while others will open in other apps. You can move files to other locations or download them immediately by moving them to the On My iPad folder. You can touch and select a file to drag and drop it elsewhere — into an app icon in the Dock, into a folder, or elsewhere. Select the first file you want to move until it expands a little and becomes an object that will follow your finger as it moves around the display. To add additional files, just tap them with another finger while continuing to hold the original file – you should see them stack under your finger. You will also see a small red number that shows how many files you have gathered in the collection. You can use a third finger to browser through Files to find a place to store all these files. It makes complete sense to tag your files when using your iPad for productive work. Not only does that make things so much easier to find, but the tags used will proliferate across all your other Apple devices (including Macs) which should enhance your entire workflow. There is no limit to the number of tags you can add to an item, which makes tagging an effective way to share assets across multiple projects. It’s also possible to assign unique names to tags used on an iPad — tap Edit at the top of the sidebar, tap the tag name to select the text, and type the new name. To optimize the order in which your tags appear in this view, just hold the hamburger icon beside an item and drag it to the desired place. To delete a tag, tap Edit and the red minus symbol. NB: This is non-destructive. Items using that tag will be de-tagged, not deleted. Tags are an excellent way to automate file structures on an iPad. Not only do they make it easier to find things on all your Apple devices, but they facilitate using items across multiple projects without creating too many duplicates. It makes sense to use Favorites frugally so they remain easy to navigate. I advise deploying a single folder for essential items and also adding current projects to the section. To add a folder to Favorites, either press and hold the folder in the main browser window until it becomes an object and drag and drop it to the Favorites section, or press and hold the folder and select Favorite in the dark contextual menu strip that appears. To Unfavorite a folder, tap the Edit button at the top of the Sidebar and then tap the red minus icon. It is possible to share and collaborate on items from inside Files. To do so, tap and hold a file and choose the Share item. This opens a slightly unique Share sheet from which you can invite others to collaborate. Invitations can be sent using Message, Mail, and other apps if installed. When collaboration is in place, everyone will see the latest changes made in the file. Files has the following keyboard shortcuts that will help you use it more efficiently. Learn these to get more done a little faster. Even the all-new USB-C-toting iPad Pro lacks support for external mass storage devices. That’s a little frustrating when you are attempting to do all your work on an iPad rather than a notebook, but it’s not impossible to find an external storage solution. Drive manufacturers, including Western Digital and Seagate, manufacture external network drives that you can access from an iPad using an app. Alternatively, Stratospherix publishes the respected FileBrowser app. This is compatible with Apple’s Files app and connects to any available network storage, including computers, NAS drives, wireless SD cards, as well as any FTP or other forms of personal online storage you may use. You can find out more about the app here, but it means that as long as you have a Wi-Fi connection and some form of network storage, it is possible to save and access files. While neither option is as simple to use as PC-style external storage, it does provide you with an option that lets you save files, work on (and stream) stored files from external drives. Up next: Essential apps to help you stay productive and how to keep your iPad secure when you’re using it to replace your laptop.